You can almost feel the wind and smell the rosemary-like scent of the trees when you listen to Ottorino Respighi’s work “The Pines of Rome.” The grace and grandeur of the trees enhance the landscape, and while the trees fulfill our desire for beauty, they also serve other purposes. Pine, in both its real and very near-real counterpart, appears most often in December as a Christmas tree. It made an initial showing indoors in Roman times as a reminder of the changing season. Now, festooned in all its glory during the holiday season, it becomes the backdrop for family photos, a vehicle that conveys hospitality and warmth, and a reminder of how lonely those far from home feel during the season. In nature as the wind blows—and before the trees make their way along the Interstate to a lumber camp, or to their point of sale, often a street corner in Manhattan—their seed-bearing cones fall to the ground. The cones when festooned with ribbons, bells, and holly will become centerpieces on tables laid with the best china and silver for the holidays. And what becomes of the nuts, so tiny, so tasty, and so difficult to harvest? They become versatile additions that can appear in any course from appetizer to soup to, well, nuts. 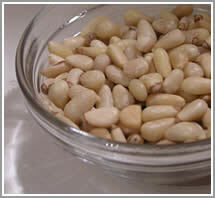 In some recipes the nuts serve as garnish; in others, they become an integral part of a dish. You probably wouldn’t want to serve a meal built totally around pine nuts. But try each of the recipes listed below on separate occasions. Make sure you buy only the freshest nuts. Buy them at any popular market specializing in Italian or Mediterranean foods. Look for a shop that has frequent turnover to assure that the nuts are fresh. The nuts are fragile and will become rancid quickly; store any unused nuts well wrapped in the freezer.